1) Cigar makers, brand owners, blenders, and factories have been frantically scrambling to meet the August 8 deadline set forth by the FDA. Perhaps no single individual, however, has been as busy (at least not publicly) as Steve Saka of Dunbarton Tobacco & Trust. “It has been an incredibly grueling 90 days,” he wrote on Facebook yesterday. “I have finalized five marca designs and over 15 ligas between 46 vitolas. Thankfully, I had been buying leaf and working on all of these blends over the past year. While there are some packaging tweaks required, none of any of these cigars are half-baked. 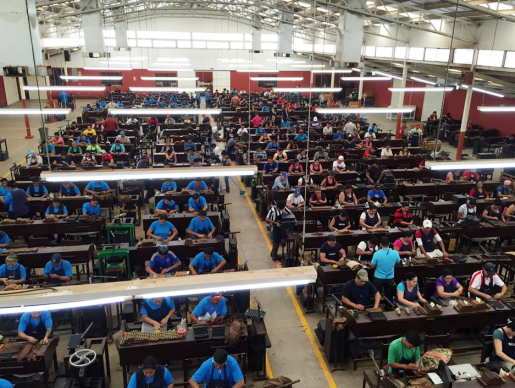 I must express my sincere thanks to my partners at both the NACSA (pictured above) and Joya de Nicaragua factories. The demands I put upon both, in particular Joya, have been beyond reasonable.” What do we know so far about Saka’s forthcoming cigars? We know there will be a new Broadleaf-wrapped line called Mi Querida, a Nicaraguan puro line that will be made at Joya and retail in the $6-9 range, a line called Muestra de Saka, and new Sobremesa Elegante en Cedros and Short Churchill ligas that are tweaked to be a bit stronger. 2) This week it was announced Miami Cigar & Co. will be the exclusive distributor of The Upsetters, the second line from Nicholas Melillo’s Foundation Cigar Company. The Upsetters will debut shortly. It follows El Güegüense (“The Wise Man”), which was Melillo’s first solo cigar brand after leaving Drew Estate (where he worked alongside Steve Saka). “The Upsetters is possibly my most exciting and thought-out product to date,” said Melillo in a press release. “By using both Jamaican and Nicaraguan filler leaf, the brand pays deference to the ancient historic relationship between Jamaica and Nicaragua when the two were geologically connected by a land bridge known as the Nicaraguan Rise.” The Upsetters brand will be offered in eight sizes and retail for $5-$12. Each size will either have a Claro, Maduro, or Candela wrapper. 3) In other major news, last Friday brought the public confirmation of the long-rumored purchase of the Oliva Cigar Co. The buyer is J. Cortés Cigars N.V., a private business out of Belgium known for its machine-made cigars. The resulting company will have annual revenues of over $100 million. According to reports, José Oliva will stay on as the chief executive officer of Oliva. Terms of the deal have not been disclosed, though Oliva reportedly turned down a higher offer from General Cigar before agreeing to be purchased by J. Cortés. 6) Deal of the Week: Want to fill your humidor with some high-quality cigars on the cheap? This Secure Server Sampler features ten cigars that will normally run you over $60 for just $29.95. Move quickly as these deals tend to sell out.